The alarm rings and instantly, I reach to turn it off and roll back over. I shut my eyes for a few more minutes of sleep and it isn’t long before the voice creeps in “get up,” it whispers. I throw the blankets over my head thinking it’ll help silence the voice but it only grows louder “you need to get out today. It’s supposed to be a beautiful day, you’ll have the place to yourself, you need the space in nature to clear your head, have some fun, and catch some fish.” Although more sleep sounds nice, I know I can’t turn my back to the call. Before I know it I’m on the road driving West with the colored sunrise waving to me through my rear-view mirror. I arrive at the trailhead of this no-name hike with only a few cars in the dirt parking lot. I’m solo on this mid-week alpine excursion and that’s just the way I like it. I spend more time than I like to admit packing my gear with essentials: fly box, plenty of dry flies, tackle and gear, reel, rod, buff, sunscreen, copious amounts of water, first aid kit, extra food and clothing. Second in importance to fly gear, I grab my Sony a6000 camera. An amateur with my camera, at best, I recently discovered a beginners love for all things photography. Much like fishing, photography immerses me with the task at hand. Setting up scenes in my viewfinder, adjusting settings to figure out the best way to capture scenes that seemingly can’t be captured all while wandering around the woods. The hike in feels long on this particularly sleep-deprived morning. It’s barely past 7 am and that means feeding hour for all the woodland creatures. Or at least that’s the story repeating in my mind as I painfully struggle up this trail. It’s steep and littered with large boulders that require not only monumental effort, but on a short person, they require lifting my seemingly useless legs up the boulder stairs one painful step at a time. Not only is the terrain moderately challenging; I’m solo. Hiking when you could have used an hour extra of sleep not only challenges the body but it challenges the mind. I imagine in all the silence out here that there are animals stalking me. Even worse, I imagine it’s only a matter of time until I come around a blind bend and stumble on an unsuspecting bear or cat. I feel this is inevitable. This is a fear that remains with me on every solo-hike I endure. As I edge further upwards, the terrain changes. At first, it feels like a walk in the woods and I’m enclosed by evergreens on all sides. Then, the forest opens up to large, lush green meadows before closing in on me again with trees on all sides. This repeats for miles until the trail narrows. I know from my pre-hike research that this trail isn’t heavily trafficked and at this point the trail conditions prove me right. The trail is now a muddy path void of all signs of human foot traffic. What is visible in the mud are the delicate paw prints and tracks of the woodland creatures; clearly I am not alone here. I get stuck in the mud while slogging up the steep trail. I do everything I can to scare away the unseen lurking animals and this alone is a scene to behold. I talk to myself, out loud, and about everything. Every time I go into the untamed wild, I gain perspective and clarity. Personal trials and tribulations seem smaller in the grand scheme of the outdoors and different perspectives about life can be experienced. This becomes possible most often when standing in the company of giant mountains. Unknowingly in what they do, when you witness them their monumental size forces you to recognize how small you are. Every problem you think you have, every stressor or concern is nothing more than a speck out here in the wild and sometimes, it takes standing in the shadows of granite giants to see that. This is why I hike for trout. This is why I drag myself out of bed sleep deprived and cranky and drive myself to desolate trailheads only to spend hours dragging myself up a mountain; the journey out is always a journey in. I don’t know how long I spend exploring this before I’m snapped back to the task at hand and the task being very, very large cutthroat trout. I convince myself the trout are hungrily waiting for my flies and I hike on. Upwards I go while repeating to myself “just keep swimming, just keep swimming.” I pass by two people on the trail, the only people I’ve seen all morning, volunteers with the forest service out hiking on their day off. I breathlessly ask them, “Am I almost there?” Their response fired me up: I still had at least half a mile to go and it was all uphill. With fire under my feet I dig my hiking poles harder, open my stride and do my best impersonation of an animal bounding up a mountain. The scenery becomes more open and vast. I’m above tree-line next to a small lake but not the one I’m headed to. Back through the mud where I can barely find a trail and just then, bam. I feel like I’ve been smacked in the face and the wind is knocked out of me. I stand there, breathless and numb and can’t believe my eyes. I’m sure I’ve never seen anything as beautiful as what I’m staring at. Two large trees frame the opening of a meadow that stretches further than the eye can see. It’s blanketed in wildflowers. I literally have to tell myself not to go tromping in. 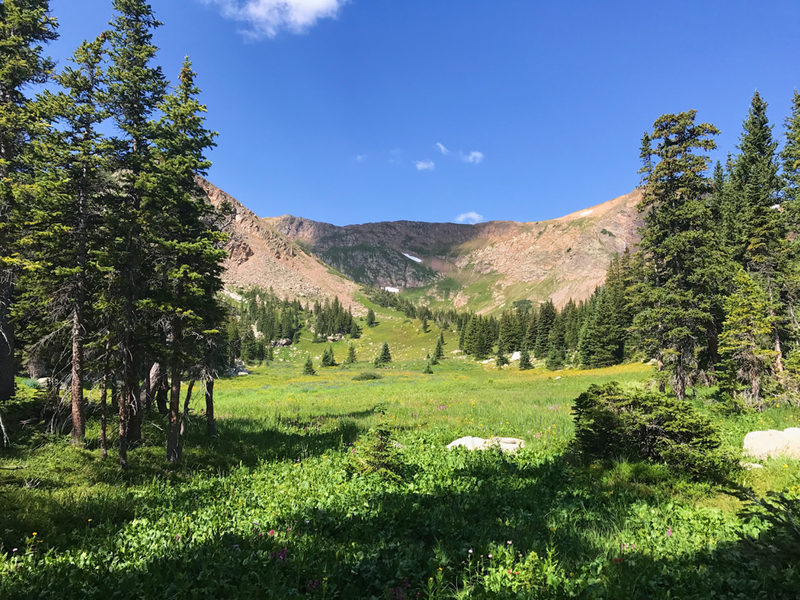 Leave no trace, take only memories… The meadow pushes back, back, and further back where it eventually meets a spiny ridge mountain peak. Its shape reminds me of a crescent moon with the northern and southern sections of the ridge like long arms, outstretched and protecting the meadow. A majestic protector, the peak shadows its bounty below. Up over the final ridge and that’s when I see it, a monolith of a lake. How in the world am I going to fish this thing, I wonder. Coming down off the ridge I’m practically running now. There’s no one in sight. The silence is loud. I have this entire world to myself. I make my way to the rock shelving on the far side of the lake. I rig up. My go-to for alpine trout is usually a wolly bugger or an articulated streamer. That’s when I see them: the trout. The big, beautiful, blood-red-streaked cutthroat trout. They’re swimming from the deep center section of the lake and cruising the shelf looking for food. They’re not spending a lot of time in the shallow, exposed sections of the lake, that’s for sure. I only spot a few cutty’s cruising the shore and like a kid excited as Christmas morning I cast. Cast, and cast again. Missed hook-set after missed hook-set. This went on for hours. Regardless of my terrible hook-set skills, I hike around the entire lake throwing steamers and desperately, setting up a nymph rig. 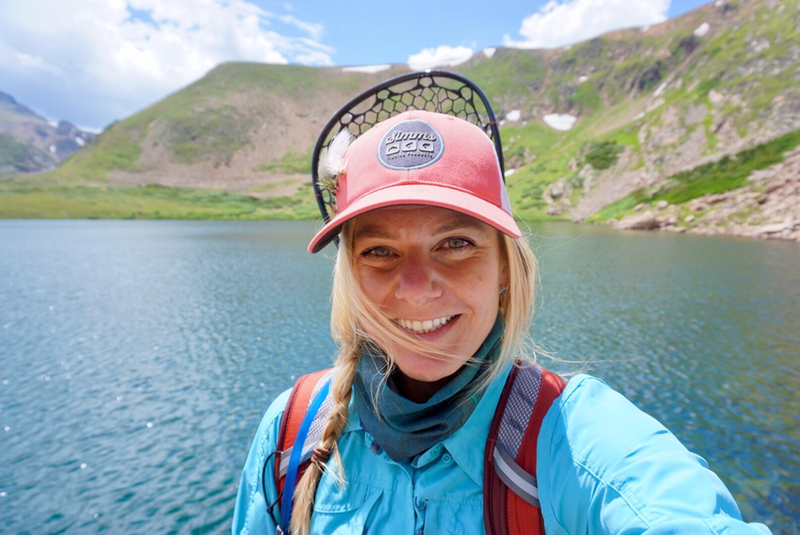 I shelter beneath my hat and buff while feeling all the suns’ rays at this altitude, somewhere between 10,000-11,500 feet, with exact details being withheld so that this beautiful lake that shook me to my core and gave me my weekly dose of perspective can stay as beautiful as possible while gifting other adventurers with as much wonder as it gifted me. There were no massive cutthroats landed that day and as I stood on the ridge on the hike out, I looked back at this breathtaking scene one last time. It was then that I realized I didn’t care about catching fish. I received everything I needed from the alpine that day and with that, I descended the ridge and headed home, with alpine scenes and fishy dreams to pass the long walk back.